What’s going on here? 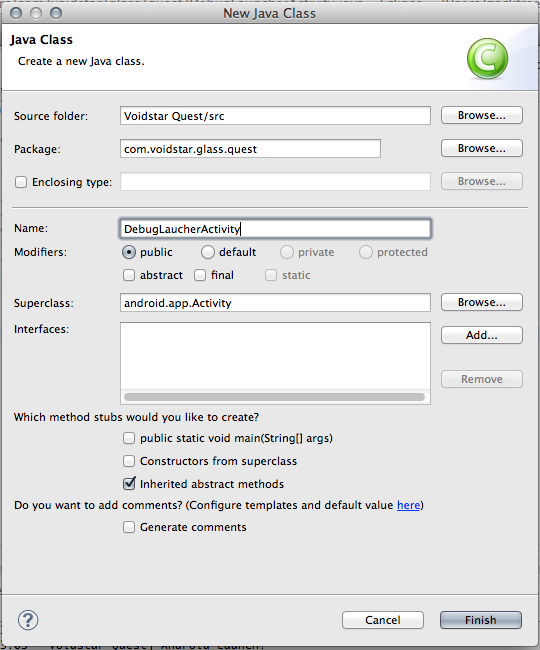 Eclipse and Android Studio seek out a MAIN Activity that responds to the LAUNCHER intent to automatically launch the app when you deploy it. Glass doesn’t have a launcher, and none of the sample apps have an Activity that could be considered Main, so the IDE farts out the warning and you have to manually launch your app like a chump. Every goddamn time. In this tutorial, we’ll add a dummy Activity so the IDE will automatically launch the app. As a bonus, we can preload a fake voice result to test apps without having to run test cases through Google’s ultra-sketchy speech-to-text servers. This tutorial assumes you already have a functional GDK app open in Eclipse. I’m demonstrating on one of my apps, Voidstar Quest, namespace com.voidstar.glass.quest. Step 1: Add an Activity to your project. Right-click on your app’s namespace under the src folder and hit New –> Class. Give it a Classy name and make sure it inherits from android.app.Activity. I called mine DebugLauncherActivity. Step 2: Add the Activity and intent filter to your manifest. Open your AndroidManifest.xml and find some nice whitespace inside the application element. Add the below Activity element, making sure to match android:name to your app’s namespace and the name of your new Activity. The intent-filter is the important bit – that’s what Eclipse and Android Studio look for when deploying the app. The android:label is irrelevant, and only nerds who use Launchy will ever see it. Step 3: Make the Activity launch your Glassware. Of course, if your Glassware’s entry point is an Activity, call startActivity(intent) instead. My entry point is a Service named QuestService, so modify that line to match your app. We’ll use the commented-out line in Step 4, Spoofing Voice Results. If you don’t need to do so, you’re done! Hit F3 and let the convenience flow through you. Anything passed as the results parameter will be identical to the results returned by voice, making testing reproducible and FAST!! Simply adding a LAUNCHER intent-filter to your Glassware allows the IDE to start your app after deployment, speeding up your testing cycle and making tests more reproducible. I highly recommend it. A warning: Users who have Launchy or mad adb skillz will be able to access this Activity, so make sure you remove it for release! Also remember that this will not automatically turn your Glass on. You may want to put a momentary Wakelock into the code to force Glass to turn on the display. Thanks for reading, and may you be a highly productive cyborg. 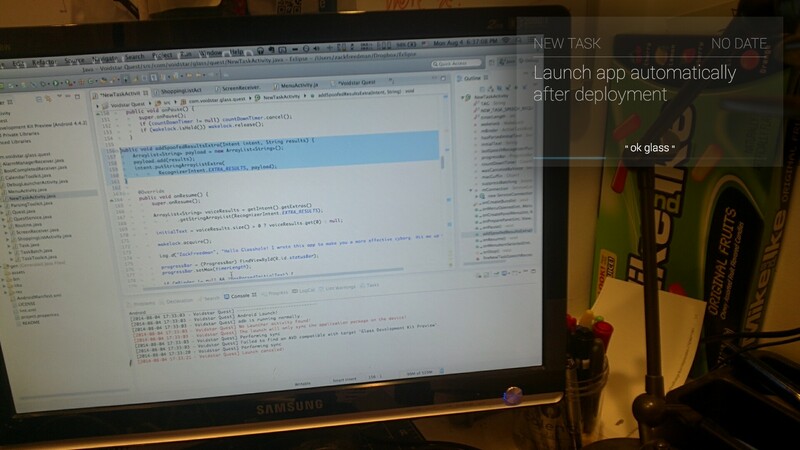 This entry was posted in Cyborg APps, Development, Google Glass, Tutorials by Yours Truly. Bookmark the permalink.